The Deathly Hallows represents the three most powerful items in the Wizarding World of Harry Potter. The watch dial displays the Deathly Hallows symbol which is instantly recognisable to any Harry Potter fan. The watch face is 30mm with a black faux leather strap. The buckles are silver plated and engraved with the Harry Potter logo. Presented within a branded Harry Potter watch box. 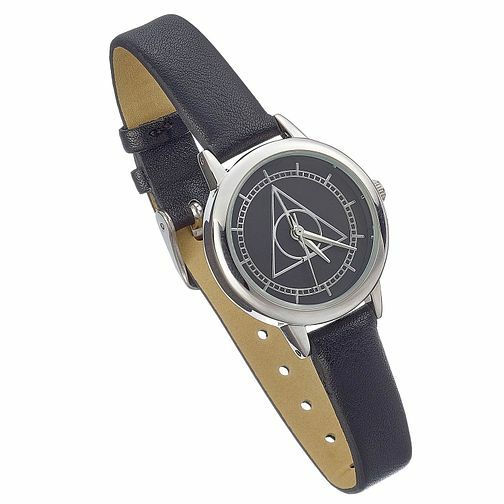 Harry Potter Deathly Hallows Black PU Strap Watch - 30mm is rated 4.0 out of 5 by 1. Rated 4 out of 5 by Anonymous from Just the thing for a Potter fan Any Potter fan will recognise the watch face, my daughter was very pleased to receive it, and if she wanted to bling it up she can always fit a different strap to it.